But on her first night in her new home, Isobel starts to fear that it isn't only her life that's unraveling-her sanity might be giving way too. Because either Isobel is losing her mind, just like her artist father did before her, or she's seeing ghosts. Either way, Isobel's fast on her way to being the talk of the town for all the wrong reasons. When you get choked up due to laughter in the first few pages, you know you have a great book in your hands. The plot was great and the dialogue was even better and this book was a lot creepier than what I thought. 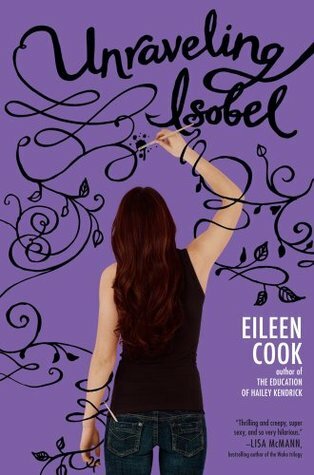 I personally think that we need more characters like Isobel in young adult books. She was smart and stubborn. You know, that kind of character that has a snarky retort to everything. I enjoyed every single second of her in this book! - Do not consume any kind of: liquids or foods while reading this book. I assure you that you’ll damage your copy due to that kind of laughter that doesn’t allow you to keep anything in your mouth. Including saliva. - Avoid reading this book in public or in the library. Unless you don’t care what people think of you. - Be prepare for an all-nighter. You won’t want to put this book down. - Turn all your lights on while reading this book. Isn’t she charming? And this is just the beginning of the book. Imagine the rest. Here's a link to the first chapter of Unraveling Isobel. Enjoy!